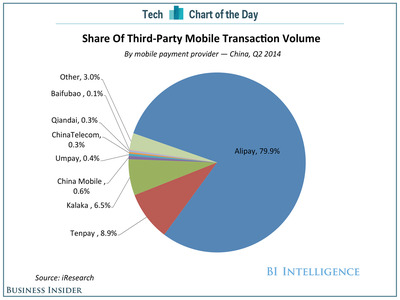 Alipay is making huge waves in China. Based on iResearch data charted for us by BI Intelligence, Alipay has been driving consumers to use their mobile phones for financial transactions — Alipay accounted for 80% of all mobile transactions in China in the second quarter of 2014. All of the other companies are far behind, including the Tenpay service operated by Tencent, one of the country’s largest social networks, which only accounts for 9% of mobile transaction volume in China during that quarter.